This week we had a quiet Sunday lunch at the Vicarage – it was just our family: Rocky had an invitation to lunch out and I’d been disorganised about having folk over. So for pudding I decided to trial a recipe I saw on 22 Words a while back. 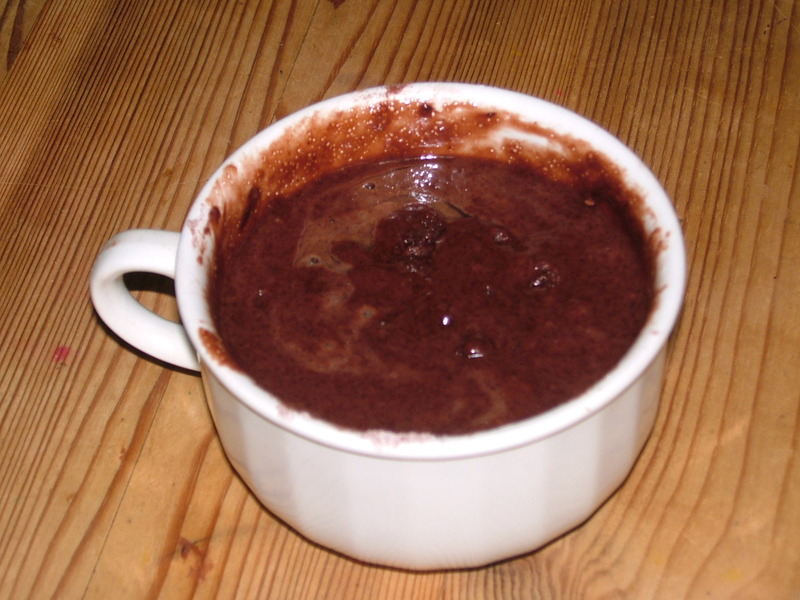 It’s a chocolate sponge speedily cooked in a microwave in a mug. It was a great success with the Vicarage crowd, and two portions served four of us generously (the Engineer was not in a puddingy mood). It would be lovely served with vanilla ice-cream, which was lacking in our freezer so we ate it with lashings of double cream (a half pint between us – eek!). 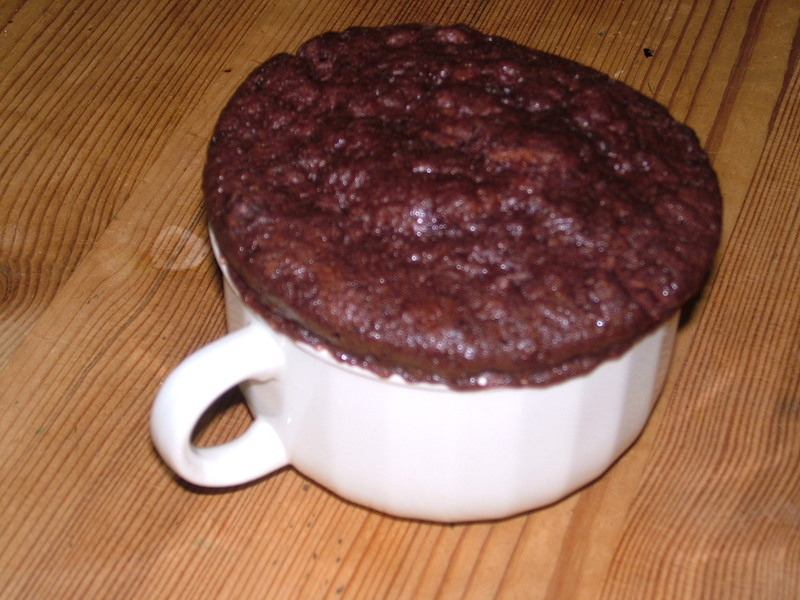 The recipe was originally titled ‘3 minute brownies’ but what you get is more like a hot sponge pudding. Although it takes about 3 minutes in the microwave, total production time was rather longer – a whopping ten minutes for two of them, I reckon. A perfect pause time between courses, actually. First, mix the dry ingredients (flour, sugar, cocoa) in your mug. My mug (more an enormous cup, actually) had a capacity of 300ml, and I think this is about the minimum you need. Then break in the egg and add the oil and milk. Mix all together until you have a smooth batter. Pop it in the microwave on high heat for 3-4 minutes. Mine took 3 1/2 minutes in our 800W basic Matsui machine. The sponge feels pretty wet, but is firm to the touch when cooked. Spoon into a bowl and enjoy with cream or ice-cream. Next time I might mix up the batter in a jug for ease of stirring (although this would add to the washing up, always an important consideration I feel). And I’d quite like to try experimenting with making a lemon version. I’ll report back on that one. In the meantime, why not try it for pudding this evening? We had an interesting discussion at Sunday lunch with our kids on the meaning of ‘Calvary’. As well as its primary Christian meaning, it’s the name of another congregation that meets in our church building and they were interested in the origins of the word. The Joker thought it was a brand of chocolate. Then someone suggested something about soldiers on horseback. And there was a protracted discussion about pubs that serve roast lunches. Thankfully noone came up with yellow birds or long green salad sticks. Today in the Vicarage we had two reminders of how our tax money gets wasted by the government itself and by individuals in our society on behalf of everyone else. Firstly the Vicar had his PAYE Coding Notice come through from HM Revenue and Customs. This was corrected from the erroneous one we received two weeks ago, which gave palpitations to approximately 7000 Church of England clergy around the country as it almost halved their tax-free allowancee. I wonder how much money sending out a replacement letter cost? The guesses on the grapevine cite the closure of the specialist clergy tax team as a reason for the error. Whatever the cause, it caused unnecessary stress and extra government-funded work. Not really good enough HMRC. The other instance was that of a friend, who had spent the morning with a lady from the Benefits office. The friend had been reported for not declaring income from work. Actually, this was voluntary work she’d been doing, for which she received no remuneration. Once she’d explained to the Benefits Agency lady what remuneration meant, the lady was happy with her explanation (which was accompanied by a letter from the folk she was volunteering for) and left. It seems that someone with a grudge had reported our friend and wanted to cause her inconvenience, rather than just speak to her and ask or even ask the place where she was volunteering. We’re only talking a couple of hours of volunteering a week here, not something that took all her time. Or perhaps the person didn’t bear a grudge, but was concerned. It’s still a great pity that they didn’t feel able to ask directly. The cost to the taxpayer of letters, staff time and form-filling must be sizable. Especially when you multiply this situation around the country. And now our friend thinks that someone is intent on causing her trouble. We have a broken society of broken people taking out their grudges by using government agencies. I don’t know how that can be fixed except by the power of change that is brought by belief and trust in Christ. Worried About Your Clergy Tax Code? Never fear – HMRC have made a teensy slip-up. They’ve posted PAYE notices with erroneous tax codes to ‘most stipendiary clergy’ according to the CofE. The Vicar’s tax free allowance had almost halved! I thought it might dip a bit, after we spent less on gas and electricity than we anticipated last year (clergy have a special tax-free allowance on part of this due to their homes being used as a place of work). But I hadn’t thought we’d been that frugal. 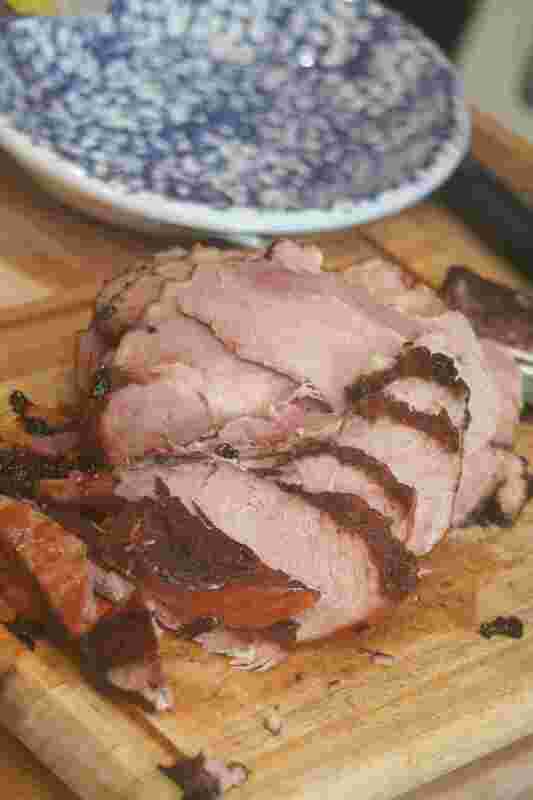 As I munched on yummy leftovers for lunch today, I thought it was time to blog my roast gammon recipe. Although it’s not all roasted – mostly it’s boiled, which ensures that it’s moist, whilst the roasting (with a glaze) sets in a little crisp sweetness. Gammon is an excellent Sunday lunch joint – no waste and wonderful leftovers. And last week, in our local Tescos 2.7kg joints were going for £6! So we had one yesterday and another is in the freezer. The great advantage with gammon is that because it’s great with mashed potatoes, rather than roasted, you can have it mainly cooked before church and eat Sunday lunch at lunchtime rather than midafternoon, as tends to happen with anything involving roasties. So this recipe is specially adapted for Vicarage dwellers, or anyone wanting to go to church on a Sunday and come back and eat within an hour or so of returning. I usually rinse the joint in cold water – there’s never enough time to soak it or boil it up from cold, I find. Although lately I’ve not even bothered with this rinse. Then I simmer it for 30mins per 500g in something tasty – cherry coke, ordinary coke, cranberry or apple juice, cider or (an excellent discovery tried this Christmas) leftover Spiced cranapple from the carol service. I usually pop an onion in alongside the joint too. Usually on a joint they tell you to cook it for 35mins per 500g plus another 35mins, but since I’m leaving the joint in warm juice during the service, I ignore their instructions. Then when I get back from church I whack the oven up to 200C (Gas 6) and whilst it’s heating up I put the tatties on and fish the joint out and put it straight onto a roasting dish which I’ve lined with foil. Then I remove the funny plastic holder thing and carve off the top layer from the fatty skin part. I use the knife to make a diamond pattern and stud the criss-cross of each diamond with a clove. Then I cover the clovey fat with a sweet sticky topping. This might be (easiest and peasiest) black cherry jam boiled up a bit to make it stickier, or maybe some black treacle, or some brown sugar and mustard. My top tip for this is to have everything you need to hand before you start – teaspoons, cloves, mustard, sugar or whatever. It’s sticky and it’s better to get it over with quickly. Then I pop the ham in the oven for only 15-30 minutes. Any longer and the sugary topping begins to burn and weld to the bottom of your roasting dish. So set the pinger to 15mins and check it. I consider it done when the sweet topping is caramelised but before the bottom of the pan is completely scorched. This is why a foil lining to the dish is a good idea. I just wish I remembered that every time. Otherwise you can get the burns off by adding a sprinkle of dishwasher powder to water and boiling the mixture in your roaster on the hob. Takes off many a cooking stain. Also works on cast iron casserole dishes. Whilst the ham is cooking, pop your veggies on, yell at the Vicar to come and carve and at the children to stop bickering, check that your guests are comfortable and very soon you’ll be enjoying a warming Sunday lunch. The leftovers of course are delicious. Very popular with Vicarage children in a pasta bake with cheese sauce, spaghetti carbonara, or the new favourite, Spanish gammon hotpot. Or picked at for lunch by the grown-ups. Caught this clip the other day – there are some very funny lines, although the delivery leaves a little to be desired(!). Having made some v tasty date and coconut slices today, I particularly enjoyed the line about the dried fruit.